It's almost time for the big dressage tournament. Are you ready? This super-realistic Horse Club Trakehner Mare Riding Tournament Collectible Figure sure is! 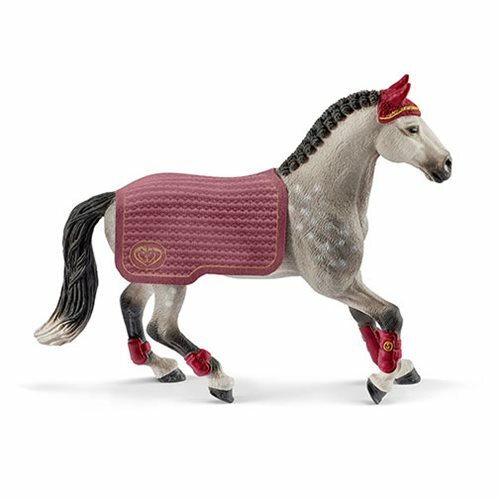 The mare comes with a removable blanket and measures approximately 7-inches tall x 6-inches long. For even more fun, collect and play with all the finely detailed Schleich Horse Club playsets and figures. They encourage children to play and learn at the same time! Each sold separately. Trakehner mares are gifted jumpers and dressage horses and are often entered in shows. Because they have a sensitive temperament and quickly become distracted by noises, at shows they often wear a "fly veil" over their ears. This allows them to concentrate better on their jumps or dressage exercises.